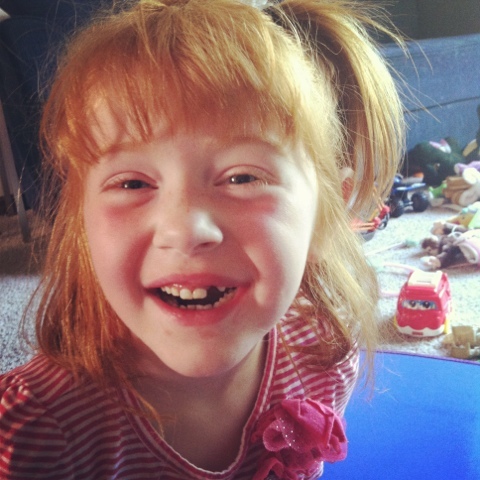 raising redheads: 2012: A year in review. 2012: Oh what a year! A year of grief, truth, growth, diagnosis, peace, acceptance, new and old. This year was compacted with everything it takes to remind a person what is good and right with the world while deliberately leaving that person desperate for Heaven. This year I found out things about my God that most people will never have to learn and I feel honored to know them. I grew in a place with Him that is quiet and resounding inside of myself. 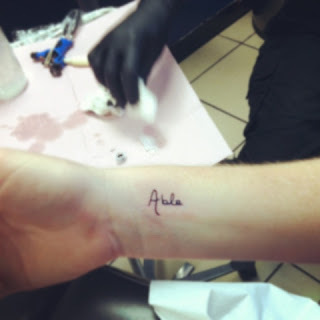 I will never be the same again. My thinking changed radically. My views and opinions were primed, pricked, molded and shifted all while creating in me a sound mind and a new heart. This year was a mess of beautiful chaos. And a beautiful mix of it all. In January, we celebrated the new year right off that bat when Bub got rid of binky. Yes, he was four. Looking back even I can't believe it. January was also the month that Mabel started to show preference for me. After a 18 months of not really caring who was holding her, feeding her, swinging her, etc...our girl finally wanted her mama! It feels like she's only ever wanted me because now for an entire year I haven't been able to let her go. 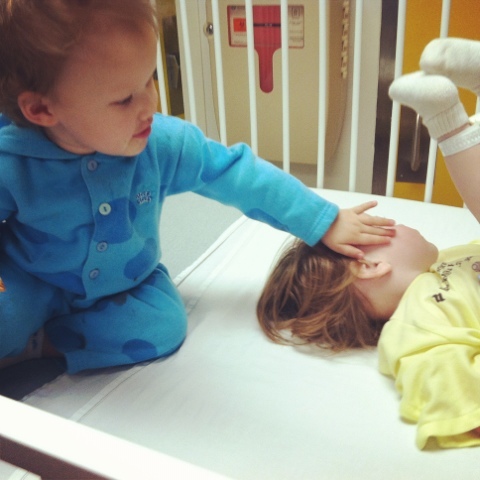 In January I began posting more about rare disease. I kicked off a series of posts that were heart wrenching and truth telling when I wrote this post. At the beginning of the year I was still very much grieving. Frantically, I was searching for answers for our little girl and was still very unhappy that we didn't have results. February came and went with sweets! We threw a girl's Valentine bash and everyone brought food that was out of this world unhealthy and completely delicious. It was one of the best days of the year! Looking back through my days and my writing, I found that I was trying so desperately to convince my heart to be ok. In this post, I chose joy. On February 29th, as we have done since our girl was born, we celebrated World Rare Disease Day by adding some amazing photos of Mabel. Several of them have now been used in adds for the Global Genes Project, Rare Disease, and Batten Disease among other things. If you see a beauty with Rare on her chest, you can bet she's our girl. March came swooping in with our first and only hospital stay of the year! Mabel was dehydrated from vomiting so much and we never did find out why. She got fluids and we were released after a 2 day stay. 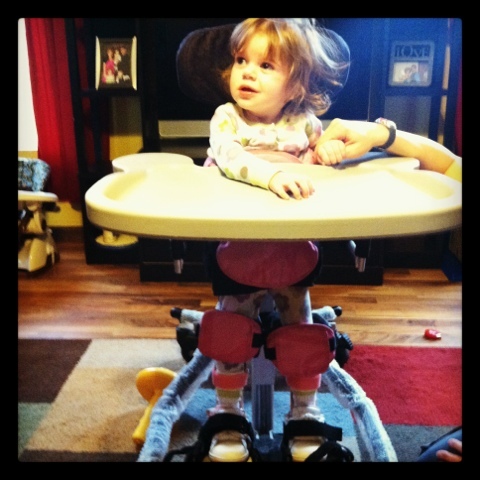 March is when we first tried Mabel in a stander. She wasn't a huge fan. We borrowed this piece for many months and now we have our own. For awhile she stopped bearing weight altogether so she was unable to be in it. March was our life-saving month! Here, you'll remember that we met our miracle doctor who would eventually give us our diagnosis. 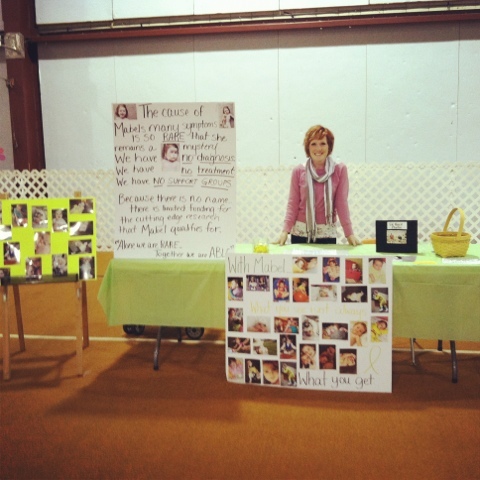 I also began setting up our Mabel's Able table at local events to raise awareness and spread the word. Nora had to have her very first tooth pulled. The tooth fairy delivered $10 after a traumatic episode at the dentist. She did well but it was hard for me! This was the month when I came across some hurtful people who said some hurtful things. It was hard to hear but I'm so thankful that I wrote about it because now I know that there was growth and initiative to push forward in educating those around me. I blogged about it here. May was a life changing month for me and for my marriage. Some things were exposed and in an emotional yet necessary way I was quite literally and instantly snapped out of my grief. I woke up to the world around me and realized that if I didn't do something to maintain my home, children and especially my marriage, even in the midst of Mabel's difficult journey, I would lose those most important to me. Daniel and I took a one day trip to Chicago to re-group and re-connect. It worked and our marriage has never been better than it is today. By May, Mabel had started swallowing better and eating more efficiently. This was the month that she began eating real, pureed food 3 times a day! 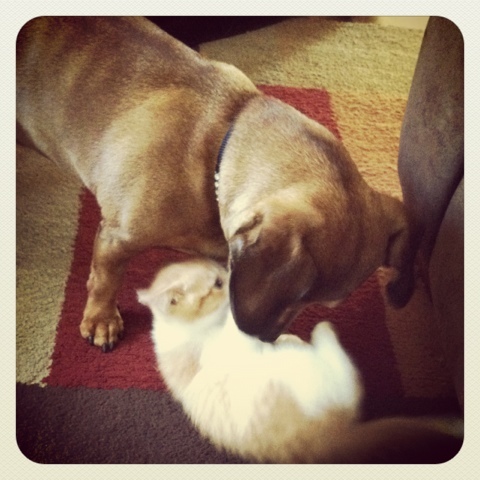 In June we welcomed a new member to our family. "Fuzzy Ginger"
We dove into summer with great zeal and enjoyed everything that it had to offer! I blogged about our summer moments in this post. In the middle of summer heat, God spoke. July was our busiest month! 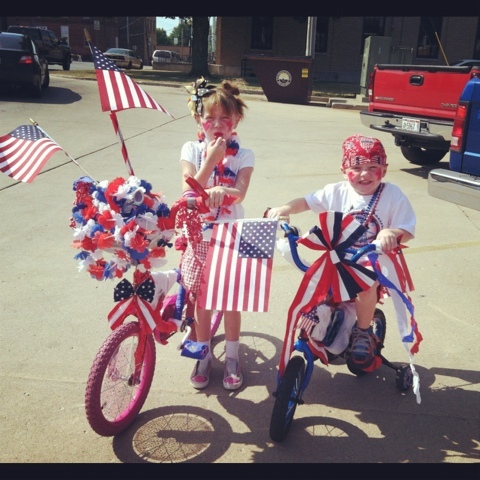 We kicked it off by entering the 4th of July bike parade! Talk about small town tradition. It was so much fun and oh so hot! In July we released our first announcement for the 2nd annual 5k Race/Walk! 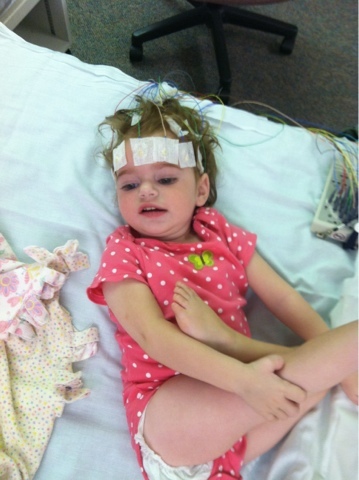 Mabel had what would be her probable last EEG to tell us what her seizures looked like. We got good news! 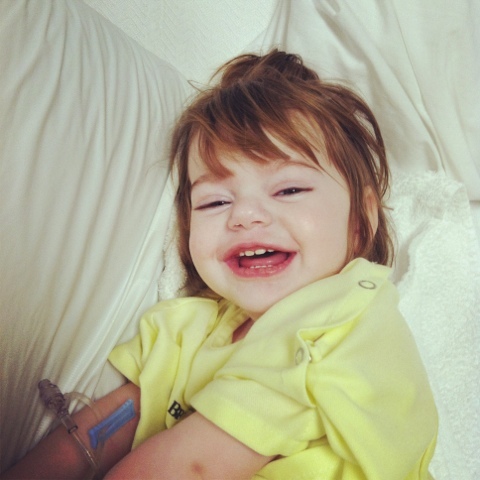 Her meds were working and seizure activity was decreased. Just a few days later we celebrated our girl fully with a birthday celebration that was not only beautiful but perfect! She turned two on July 16th. On July 18th, 2 days after our girl turned 2, we received the call that changed everything and nothing. Mabel was official diagnosed with NCL/Batten Disease, a terminal brain disease that causes all of her symptoms and early death. Her prognosis? 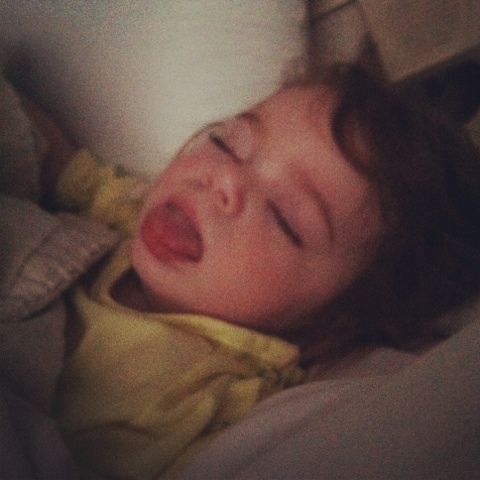 Children with symptoms as early as Mabel usually live to be about 5 years of age. I blogged about the call and my thoughts in this post. Jeni and I went a couple days later to fulfill our tattoo dream of the year. 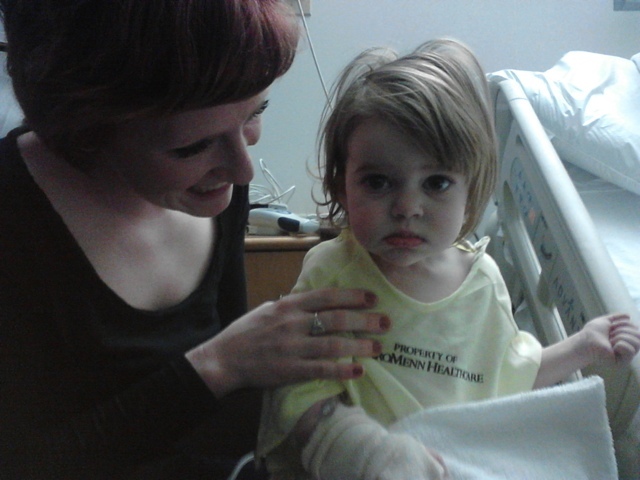 Just a week after Mabel's diagnosis, our dear friends from New York came to visit. Tiff blogs at www.amomentcherished.blogspot.com and we have been friends for a very long time. Please feel free to visit her page and show some love. Their story will touch your lives and their visit changed ours. Nora turned 6 on July 31st and we celebrated by spending time alone with her. It was much needed and was a beautiful day. She got to go shopping with Pawpy and Eileen and enjoyed the time to herself. I still can't believe she's 6 and we're already half way to 7. August was race month so it was busy as usual! 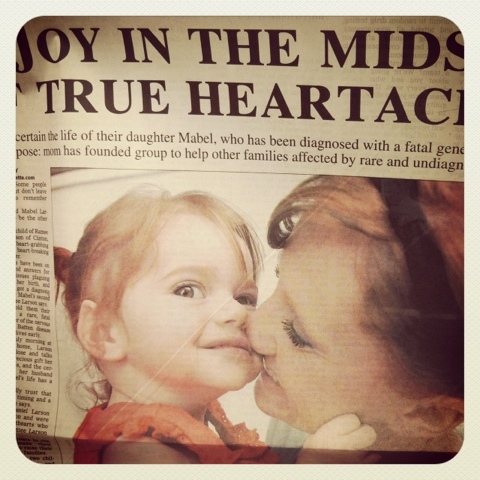 A great article was posted in the Champaign newspaper about Mabel and her recent diagnosis. In August, Nora wanted to try to go to school. We let her try and she attended the Christian School for about 4 days. After coming home and crying about missing her sister and worrying that something would happen while she was away, we re-prioritized and brought her back home. We have been faithfully homeschooling ever since! Race day came and went. 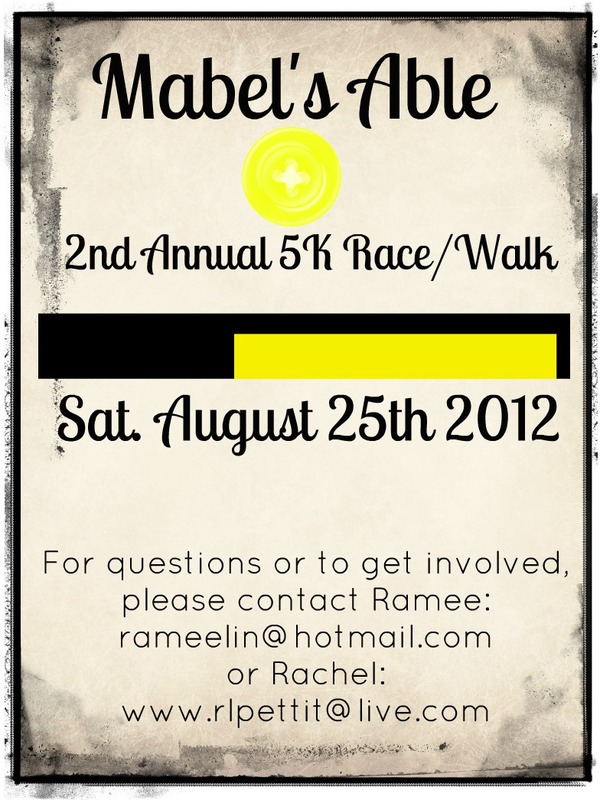 We raised $6,000 for "Mabel's Able." The money will be used for various things throughout the year and years to come such as research, gifts, or anything else that may come up for families of rare disease! In early September our boy turned 5! Fall was blowing in and I went a little inside of myself. We spent many days outside in the yard on quilts. Many friends met us there with snacks, drinks, school work, toys and books. We made beautiful memories in September. In October, as I was feeling acceptance take over I was also feeling restless for a God who seems so far. I wrote this post and cried out for revival in myself. We had the annual wiener roast and enjoyed fall to the fullest! In October the redheads went to their very first "Parents night out" at the Y. It seems silly now but it was a big step for me. Daddy and I got lots of date nights and the kids enjoyed the swimming and socializing! Uncle Jake turned 15! We celebrated him as we always do! 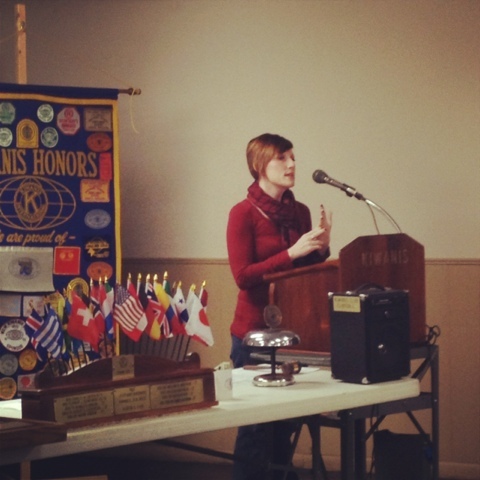 In November I was asked to speak at the local Kiwanis meeting about Mabel's Able. It was a great opportunity to enlighten our community about rare disease and how they can help! 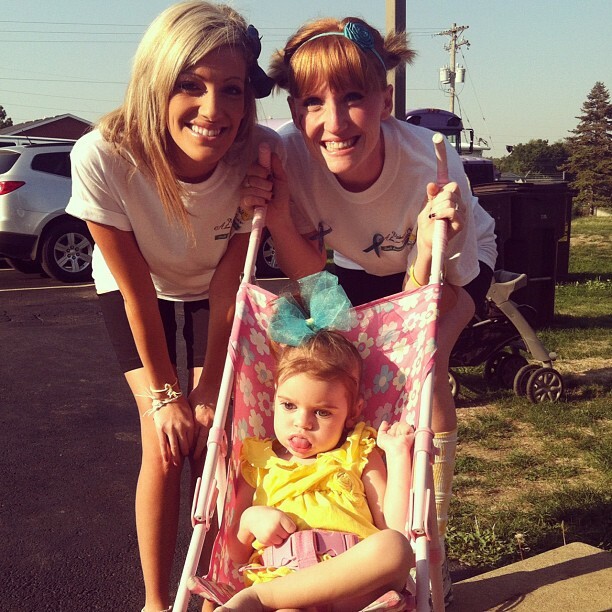 It was exhilarating for me as it always is, to raise awareness for our daughter! I just can't seem to be quiet. In November I wrote a FAQ post about Batten Disease. It got several hundred hits and many comments. People were intrigued! Mabel started to bear weight on her own again after many months of not doing it. We were surprised and hopeful! Her activity chair came and it was at the perfect time! She loves it and it has provided much relief for my back! 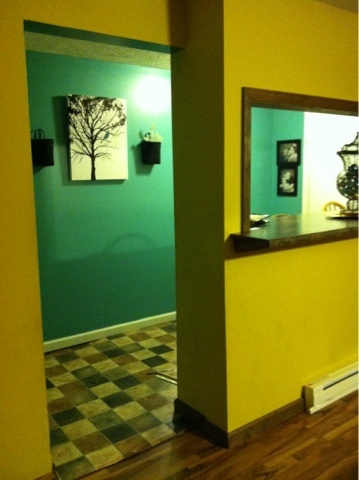 In November I wanted to begin decorating for the holidays but couldn't do so without painting at least one room. The entryway it was! Robins egg blue...or even brighter. But it's beautiful and I'm thrilled! We wrapped up November with my birthday (I turned 28-gasp) and Thanksgiving. In December we were honored to be the Grand Marshall's of our town's Christmas parade. Again, we are raising awareness not just for Mabel but all rare disease and I feel humbled that our town chose us to represent something that is so unique. It was emotional and gratifying but mostly humbling. 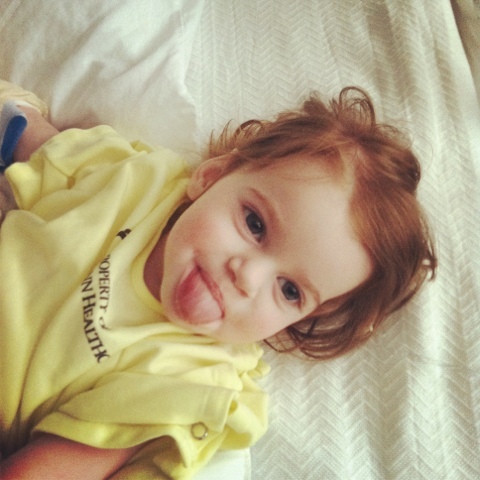 Mabel's Able sent gifts to many families of children affected by rare and undiagnosed disease. 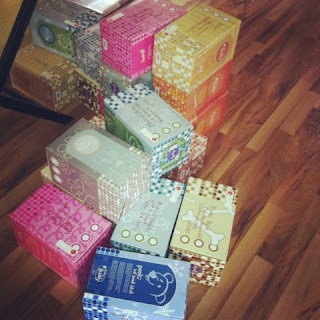 Over 20 children received scentsy buddies, shirts, bracelets, among other items. It was a great way to give back and we can't wait to do more! And most recently we celebrated Christmas. I am leaving 2012 much different than I entered it. I am no longer grieving the way that I once was, with the unknowns and unimaginables. This year brought answers and clarity that I can't describe and a peace that surpasses this life. 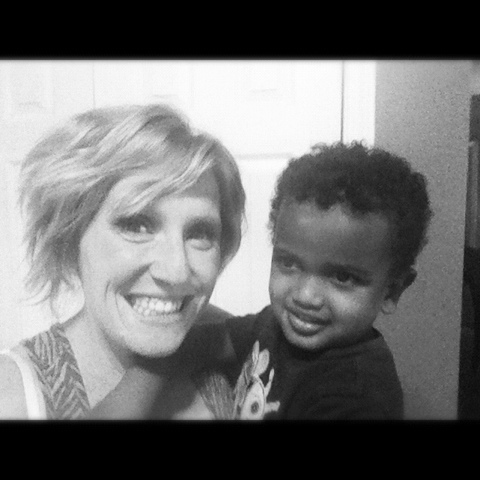 I grew closer to my children, closer to my God and went deeper in myself that I ever have. I came out better. I stayed with tradition and dyed my hair every other week. I ate far more this year than I have ever in the past. I enjoyed good food and good company and although the extra weight and lack of exercise bothers me, I wouldn't change it. The memories made out weigh the heaviness. 2012 was the year of rest. My body and mind slowed to a pace that they haven't in the past. Mabel has made me sit and be still. She has helped me to see what is important. This year I have embarked on journey's that I hadn't dreamed of before. I have made new friends and dug deeper with old ones. I have leaned on my sister more than I ever have and she has let me. I have fallen much deeper in love with my husband than I imagined I could. I have experienced hurt, betrayal, loss, loyalty, trust, companionship, freedom and joy. I have come to know a God who is real. Merciful. Powerful. I attended church less than I have in my entire life and yet I feel more free. There is a closeness and an aching for Jesus that wasn't ingrained in me before. He has drawn out of me something lasting and it happened in this home. 2012 has been good to me. To this family. There are many unknowns in the days ahead but we are looking forward with a hope in Jesus. We are basking in the knowing that no matter where 2013 takes us, we are together and it is well. Happy New Year to you all, my friends. You sustain me and carry me through. I will always be grateful for you. PS--If you haven't already, please head over to the "Mabel's Able" facebook page. We are trying to get 3,000 likes before the New Year! It's been fun seeing how many people are becoming aware of rare disease. Thanks for your help!!! blessings to your family in 2013. I just went over to facebook and liked Mabel's page.